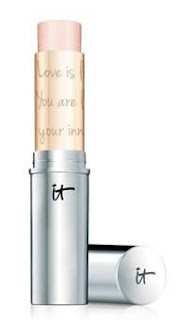 The beauty buzz straight from It Cosmetics here is the rundown on the complete look. And stay tuned for the beauty buzz on confidence in a cream compact this week along with a giveaway! "The inspiration behind Andra Day's look was 70's flower power. We wanted to focus on hydrated beautiful skin that glowed within. We also did a subtle liner with a purple cut crease to give a 70's vibe." This luxurious cream’s exclusive “dark shadow minimizing” blue tint brightens even the darkest eye circles. · IT Cosmetics Confidence in a Compact in Medium Tan – NEW!!! Perfect for even the most sensitive skin, Confidence in a Compact helps boost your skin's natural regenerative cycle. Rich in anti-aging peptides, colloidal oatmeal, hydrolyzed collagen, aloe and avocado, it camouflages any red-toned skin discolorations including rosacea, broken capillaries, blemishes, skin irritations, sun damage, scars, age spots and more. The universal translucent shade imparts all skin tones with a silky, skin-perfecting finish, while the anti-aging blend of peptides, silk, hydrolyzed collagen and antioxidants pampers skin for a more youthful, airbrushed complexion. Can be applied throughout the day for on-the-go touch-ups, and doubles as a blotting powder, too! A 4-in-1 multi-tasker powerhouse- It will take the place of your powder blush, cheek stain, Antioxidant defense and hydrating skin conditioner all in one innovative technology! The innovative formula is infused with anti-aging peptides, hydrolyzed collagen, silk, antioxidants, and vitamins A and E to treat and nourish your eyelids while instantly diffusing the look of lines—plus, it’s clinically shown waterproof even after 12 hours of wear. The original lid-loving phenomenon! Discover your most naturally pretty eyes with this must-have palette—featuring all the universally flattering shades you need for day to night, no matter the occasion! A clinically shown waterproof automatic lip liner pencil that is also a stain, so it truly lasts! Hydrating primer, and long-wear stain that doesn’t dry out lips and keeps your favorite lip product in place! Hydrating skin illuminator that conditions and nourishes your skin while giving you the perfect touch of natural-looking radiance. It gives you a healthy lit-from-within glow, that leaves skin silky, velvety and supple without using glitter, plus it never settles into lines and wrinkles!